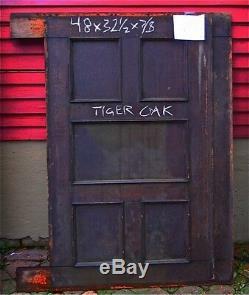 ANTIQUE VINTAGE TIGER OAK PANEL- WAINSCOT. 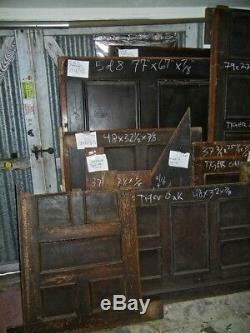 A group of extra smaller panel pieces listed that might help complete your project. These smaller panels are located in New Orleans. Price is for the group of 11 smaller panels. The smaller pieces perfect for completing your panels. These extra pieces have various configurations of small square panels and rectangle configuration. #1.-79" X 22,1/2" X 7/8. The panel has row of small squares. #2.-68,1/2" X 10" X 7/8. The long thin panel has 2 long rectangle panels ateach end. #3.-38" X 17,1/2" X 7/8. The panel has 2 small squares at each end. 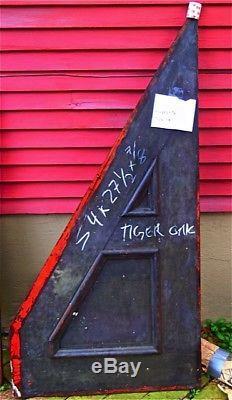 #4,---33" X 15,1/2" X 7/8. #5.-48" X 32" X 7/8. The panel has 2 small recatangles at each end with one large rectangle panel in the center. #6.-41" X 16,1/2" X 7/8. The panel has 2 small r squares at each end. #7.-54" X 27,1/2" X 7/8. The panel is corner panel triangular shaped with 2 small triangular panels. #8.-37,3/4" X 25,1/4" X 7/8. #9.-48" X 32,1/2" X 7/8. The panel has group of of small squares with recantgle in middle. 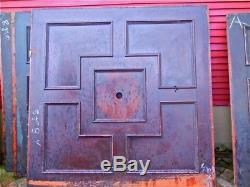 #10.37,1/2" X 17,1/2" X 7/8 T he panel has group of of small squares. #11.70" X 27" X 7/8. The long panel has 3 small Square in a row. See my other panels listed in Montgomery location. These are mostly panels with rectangular configurations. #1 Large panel rectangle configuration 90 x 45 (I include photo - It is a seperate listing Montgomery). #2 Group of smaller pieces Montgomery. One piece, 69 1/2" X 41"3/4" X 7/8". One piece, 98" X 14" X 7/8. One piece, 47" X 12" X 7/8. One piece, 38" X 12" X 7/8. One piece, 38" X 15,1/2" X 7/8. 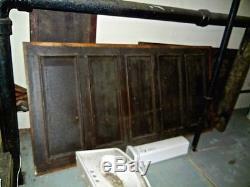 These pieces of wainscoting panels were originally located in a Southern mansion. They are made of oak. See photo - the style is pattern of rectangle configuration. Located in Montgomery Alabama 36104. Be sure to check out all my available panels I have a lot more! There are also extra smaller panel pieces listed that might help complete your project, such as the following. The New Orleans panels include 3 large panels about. 77" X 69" X 7/8 - one is a ceiling medallion with a hole in center for a Chandelier. I include photo - It is. Tiger oak is normally red oak that has a pattern it the grain that resembles tiger stripes. 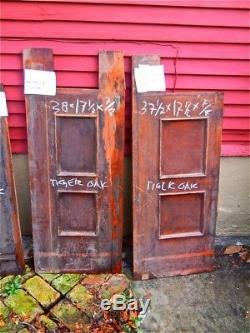 Tiger oak is the natural grain in oak wood. It truly resembles the pattern of a tigers fur when stained or polished. 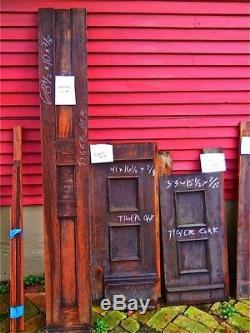 These pieces were salvaged from the foyer of a demolished home. Stripped they would be beautiful, but the wonderful aged look is great as is! 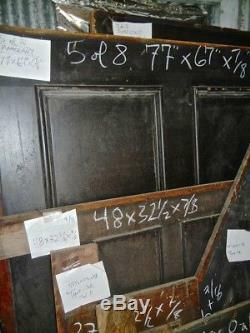 All Panels are in very good condition-only need to be stripped and varnished-- maybe some nicks and scrapes due to their age but it adds to character. 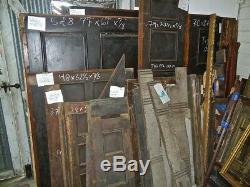 The panels are constructed very beautifully and they add shabby/chic sophistication, to your house. They are from the style and creativeness that was used during the Victorian Era, still very popular today but hard to find these old style of panels. Great for a restoration job. These came from old Alabama homes and date back to the early 1900s. As you can see in the photos they are old and and in need of a good cleaning but nothing out of character on such old pieces. They can be easily varnished and stained to match your style and décor. 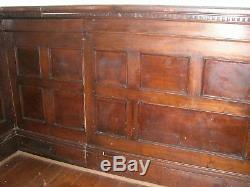 Distressed, antique, wainscoting with panel is made of solid vintage wood. The finished panels with multi-panel designs are each slightly different but can be combined in an attractive arrangement should you use some of available smaller panels. The original collector of these architectural items began collecting antiques, and antique architectural accesories from the many old homes that were torn down in Montgomery from the years 1935- 1970 and storing them in his warehouse with the intent of eventually building a home with them. The item "Tiger Oak wood Wainscot Architectural Antique raised panel Group of smaller" is in sale since Saturday, October 20, 2018. This item is in the category "Antiques\Architectural & Garden\Other Architectural Antiques". The seller is "deepsouthc" and is located in New Orleans, Louisiana. This item can't be shipped, the buyer must pick up the item.